I want to prove that the perpendicular bisectors of any triangle are concurrent. 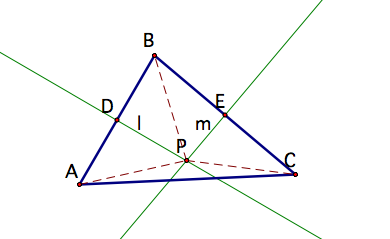 Let be any triangle, let D and E be the midpoints of AB and BC, respectively and let l and m be the perpendicular bisectors of AB and BC, respectively. 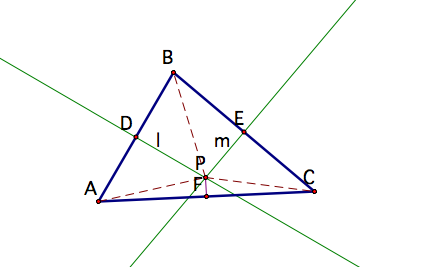 Let P be the point of intersection of l and m. The triangle is pictured below. Now, make segments connecting P to each of the vertices of the triangle. Notice that four new right triangles are formed ( , , , and ). First look at and . 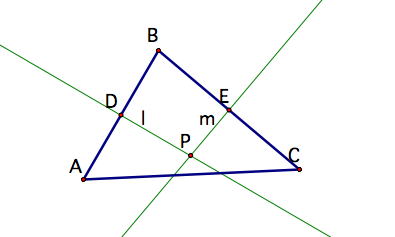 Since D is the midpoint of AB, AD = BD and since l is the perpendicular bisector of AB, and : so . By reflexivity . So by SAS, . By definition of congruent triangles, . Similarly, and . Since and , by transference, . Now look at . Since , . Let F be the midpoint of AC and make a segment between P and F.
Since , , so the segment connecting P to F must be part of the perpendicular bisector of AC. I have shown that this perpendicular bisector goes through P also. Therefore, the perpendicular bisectors of are concurrent.